We develop multi-platform games for International Studios and Publishers. Usually various ideas and concepts ! Game Development on PC/Mobile platforms. Various genres, hell yeah ! At Hammerplay, we place culture above the actual work we do. It is the core of our functioning as an independent studio; it is what we often preach, practice and iterate across. It enables us to have that much needed creative liberty and space; work with each other without any formal barriers and bond like school kids. We are also a radically different studio with a greater emphasis on flat team structure eliminating the need for leads and supervision offering a new level of control. And after all where else you get to be wearing T-shirts and Flip flops to work! Our new game Sniper is out now on Android. Our team worked really hard in building this endless post apocalyptic shooter as it went through multiple design iterations and we are fairly happy with the end result. Some in-game screens below showing the graphical fidelity of the game where we put a lot of effort. Check out some screenshots and gameplay videos in our Games page. We are looking to write a Dev dairy on this game very soon. Stay tuned! We are building games for E-sports now ! We are officially on Android now and the best part is we are starting to develop E-sports titles for the next generation of gamers. Dont looks us up on Google Play - you wont find us there just yet. We are instead looking at new and emerging platforms. We have partnered with one of the latest and largest E-sports platform where we are able to deliver super fun and competitive titles that can be enjoyed by their millions of users. Apart from being able to take some of our existing games there, we are also building some exciting PvP (real time multiplayer) games which is a great new chapter for us as we are one among the very few studios in the country building real time Multiplayer experiences ! Watch out this space for more games reveal soon and check out our games section to learn more about the games. We finish 4 years as of this September and the ride keeps getting better for us! We take this moment to thank each of our clients/partners continuing to work with us and more importantly believing in us. Of-course we cant be pulling this without our beloved team members and their family and a special shout out and thanks goes to them! Upwards and Onwards! Our top performing game Tiny Army on the Jio games just got even better. We updated the game with new characters, battlefields and weapons and it has made the game even more cooler. The updated game is up on the store - check it out today! Here is the new game trailer! Quick Racing and Tiny Army Featured on the store! Two of our games - Quick Racing and Tiny Army are featured on the Jio games store. They are already on the top charts with millions of sessions daily! Check them out now! We are extremely excited to announce a roster of our games launching on the Jio Phone. We have partnered with Reliance Jio to bring a great deal of games to their top selling smart feature phone. Five of our games are live now on the Jio Games store some of which are already on the top played charts and we are currently working on a few more games to be announced soon! Check our games out on the Jio Phone today! We are very delighted to work with Pixelberry Studios in creating some great Artwork for their hit Mobile title 'Choices - Stories you play'. Check it out on Google Play and the App Store. There is a very good chance you should see our work in there! Some of the recent round up of 3D assets we worked on. They were mostly based on the RTS Sci-Fi Genre. All of these were textured in 3D Coat with PBR based materials for that added stylized realism. The screenshots are from Sketchfab. We will likely be embedding the realtime Sketchfab assets soon! Here are the sketchfab models of the Mech and the Sentry to spin around and check out in their full glory. Some of the recent weapons we created for a Shooter game we are planning to build. The weapons were finished 3D coat with PBR based shaders. Our Artists seem to love the tool and are able to get some slick output! Check them out below. We recently did a bunch of Art assets for a popular iOS game. 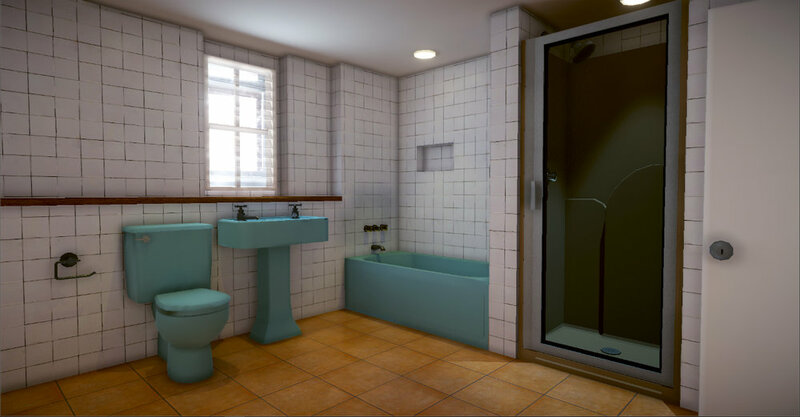 The user would be decorating and upgrading their spaces and we took on the job of transforming a not so good looking Bathroom into a luxurious space. We thought we will toss them into Unity and throw some lights in there inorder to present them better. This is in-fact how they would ideally look in the game. Here are some beauty shots (real-time ofcourse!) All assets are super lowpoly with super-low res textures! One of those offbeat or call it unconventional games we built in the recent times for a leading brand's campaign on Snapchat. Nothing fancy here, just a good old fashioned 'catch em as they drop' game but done with a nice retro theme. Legend says the game was consumed by millions of users on snapchat when the campaign was live a few months back! Trust us we couldnt play the game ourselves over snapchat due to geographical restrictions ! Some incredible stylised game characters we did in the past for various games. Rendered realtime in Unity3D. We did a whole lot of highly detailed characters and levels for this one of kind interactive 3D ride experience. Check it out! One of those first bunch of characters we did for an unannounced Mobile title - close to our hearts! A cool Character we made for a PS4 title a while back - here is a real time showcase from Marmoset Viewer! The legendary Lizzie Borden Character reimagined in our prototype - Click play and give it a spin! A tomb from the Lizzie Borden title ! Have a Game Idea to develop or need External Art/Development support ? Feel free to Contact Us with the form below and we will be right in touch with you!